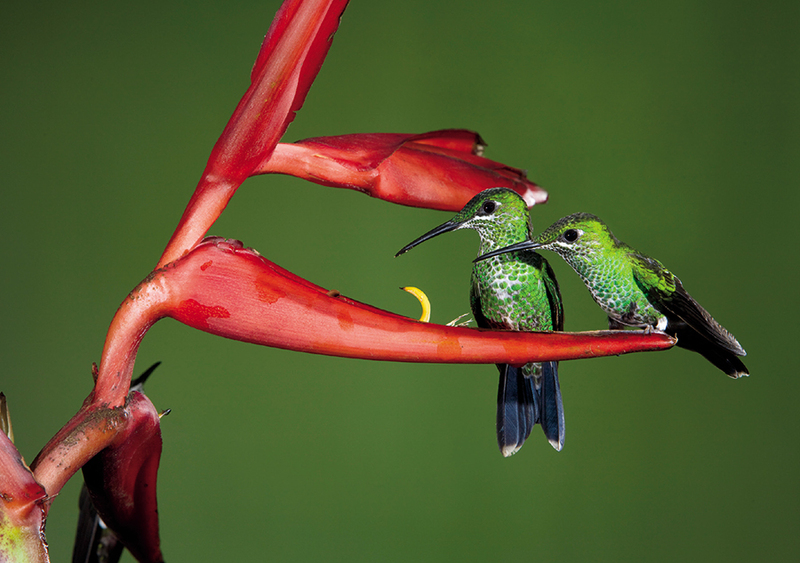 Weighing in at a stout one-third of an ounce, the green-crowned brilliant hummingbird (Heliodoxa jacula) is one of the larger members of the Trochilidae family. Eschewing the usual fast-food dining on the wing, this species almost always perches to sip nectar from abundant red tubular flowers in the wet mountain forests of Costa Rica and Ecuador. A nesting female can feast upon two thousand high-protein insects a day, caught in midair, plucked from leaves, or swiped from spider webs. Once a male establishes his feeding territory, he will use aggressive flight patterns and intimidating displays to dissuade any theft of his high-energy nectar.